The current polarization of Nigerians between what could be safely regarded as the Bourgeoisie and the Proletariat according to Marxist methodology could be better understood when studying Claude Ake's work titled “A Political Economy of Africa”. The highly respected Nigerian political scientist from Columbia University in the U.S argues robustly that in the explanation of social life, primacy must be given to material conditions particularly economic factors because economic need is man's fundamental need. He postulates that in order to understand the culture of a society and other aspects, one must understand the material, the assets and constraints of a society. 1. Those from the economically privileged group tend to be better educated, more cultured to have higher social status, to be more successful professionally and politically. This means that economic inequality is extremely important, tending to reproduce itself endlessly in a series of other inequalities. 2. Those who are economically privileged tend to preserve the existing social order; and those who are disadvantaged by the social order, particularly its distribution of wealth, have a strong interest in changing the social order, particularly its distribution of wealth. In this way, the economic structure sets the general trend of political interest and political alignments. This last paragraph above vividly explains the present political quagmire of secessions Nigeria is facing. As long as the scathing economic hardship in Nigeria and the massive gap between the rich and the poor exist, there will be more angry and hungry people who will align themselves with separatist causes at different intervals of our history. It should be noted that according to the Nigeria Deposit Insurance Corporation, NDIC, a mere 2% of Nigerians own 90% of total deposits in Nigerian banks. Nothing confirms the wide economic gap which is reminiscent of the distance between heaven and earth more than this financial report. As people in the developed world appreciate critical thinking which has birthed ground-breaking initiatives like the founding of Apple Inc, Facebook, Google, BlackBerry, Microsoft, Internet, e-commerce, clinical research programmes and other innovations that have improved human life, Africans are also thinking deep. The only problem is that the products of the thoughts of some African men could be grossly exploitative and detrimental to the human society. 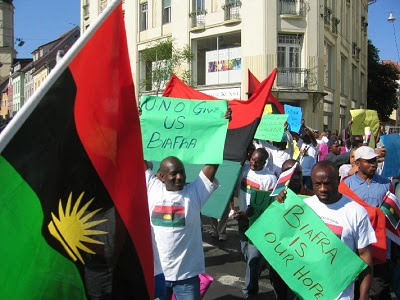 The fact that the pro-Biafra groups today have thousands and millions of sympathizers both locally and internationally confirms the fact that there is an endemic problem in the Nigerian society. Some of the prominent ones as of today are: Indigenous People of Biafra; IPOB, Biafra Zionist Federation, Movement for the Actualization of the Sovereign State of Biafra, MASSOB; Biafra Liberation Council, BLC, Eastern Peoples Congress, EPC; Biafra Solidarity Movement, BSM; Biafra Revolutionary Organization, BRO; Joint Revolutionary Organization, JRO; World Union of Biafran Scientists, WUBS; Biafra Liberation Crusaders, BLC, Biafra Students Union, BSU; Salvation of Peoples of Biafra, SPB; Costumary Government of Biafra, CGB; Council of Elders Indigenous People of Biafra, CEIPB; Bilie Human Rights Initiative, BHRI; Biafran Government in Exile, BGIE; Ohaneze Ndigbo, OTU Suwakwa Igbo and others. These are symptoms of an imminent total system collapse. People are irked that they believe opting out of the marriage of 1914 amalgamation that led to the political entity - Nigeria might be their last only hope to find succor in life. If Nigeria were to be a place like Dubai, United Arab Emirates, who would want to secede from greatness? An ailing political system like Nigeria which is dying in all areas will easily breed people like Nnamdi Kanu of the Indigenous People of Biafra and the Movement for the Actualization of the Sovereign State of Biafra, MASSOB, Ralph Nwazuruike who can play on the sensibilities of the despondent to elevate their societal status. Every challenge is a blatant chance for a breakthrough simply for those that could think deep. Today we have numerous pro-Biafra groups that have become forces to be reckoned with in the political system. They frolic with politicians and even endorse candidates. They have become foot soldiers of politicians who desperately hire their services in the areas of electioneering campaigns. They can also be used by the opposition party in distracting the government of the day and making it very unpopular through acute systematic propaganda. They even determine or let me say almost determined if a gubernatorial election will hold in a democracy where the rule of law is supreme. Spearheading agitations is an arm of political business which is viable of you are valiant enough to lead protests in hostile environments and also develop oratory skills to psyche up the targeted marginalized people. Once you win their hearts, they tend to part with the few coins in their pockets. Both Nnamdi Kanu and Ralph Nwazuruike have cases of financial improprieties hanging around their necks. These issues are either being said loudly in the media or murmured among followers who express worries about a possible r*pe of their commonwealth. Nwazuruike has been accused of fleecing some southeasterners of a whooping sum of over N500 million in an audacious international passport and vehicle plate number scam. He reportedly convinced his followers to ditch their Nigerian passports and obtain Biafra passports produced by him at the rate of N10,000 each. He assured them that the passport had international recognition which ended up being a hoax. An exclusive report by New Telegraph newspaper stated that Nwazuruike also made about N4 billion from the MASSOB project from 1999 to 2015. Money exchanged hands, money never returned to the source, the rich became richer, the poor became poorer, someone was outsmarted, someone cried and a picaro laughed. On the other hand, a U.S-based lady named Chioma Amaryllis (from Mbaise LGA, Imo State) who worked for the Radio Biafra in the United Kingdom with Nnamdi Kanu as a PR Coordinator also has a story to tell about suspicious acts of fraud allegedly perpetrated by the so-called freedom fighter. In a popular video which could be retrieved from YouTube, the young woman admitted to having a brief romance with Mazi Kanu. She claimed people who believed in the Biafra cause as championed by Kanu contributed varying sums of money across different countries but they were never fully accounted for as Kanu was not only the director of Radio Biafra, he was the Accountant General, Human Resource Manager, procurement officer, head of operations and any other offices you could ever think of. According to her, Kanu crossed the red line when he set an $8 million financial benchmark in 2014 to launch the Biafra struggle in Nigeria. “A lot of donations to Biafra went down the drain and I have a right to speak out because I contributed. IPOB is built on myth with no structure.” she emphasized. This is why it appears that being an activist in Nigeria is like a full time job that could give you your dream life without you actually doing anything productive. It’s on this ground that some people have raised questions about Nnamdi Kanu's educational qualifications which are conspicuously scanty on his Wikipedia page especially at the tertiary level. Furthermore, what was he doing before the Biafra cause? What was his job in the United Kingdom during the Biafra cause as the movement isn't a full time job that is expected to put food on the table? How did he sustain his family? These questions might have a petty outlook but they will certainly lead us somewhere if valid answers are provided. Europe despite the promising economic realities is a place for serious-minded people who treat their time the same way they treat their money. Unconfirmed sources have it that Kanu studied Political Economics at London Guildhall University now called London Metropolitan University (LMU) and that he later established a company named Alpha Phoenix consulting firm with his friend, Luke Chukuma Egemba and it was incorporated in 2005. Rumours have it that the company couldn’t muster up to £900 in four years thereby forcing Kanu to tender his resignation letter. Another interesting pointer to sharp practices in the Biafra movement is the way Kanu and Nwazuruike see themselves. It has become a case of two captains in a ship or two husbands in a nuclear family. Nwazuruike who has been running MASSOB entrepreneurially for 18 years without productivity claims he employed Kanu after picking him from the streets. According to him, Kanu was an internet fraudster in the United Kingdom and he was kicked out by his lover. He gave Kanu a new lease of life by opening Radio Biafra in the UK and handing it over to him. “When I met him (Kanu) in London he had no job and no certificate; he was into internet crime. So who is Nnamdi Kanu? It is you the journalists that are flaming him up as somebody; if not, he is a nobody” he stated. Kanu has since denied some of the allegations with claims that Nwazurike ventured into the 'secession business' for economic reasons which have paid off like crude oil during the former President Goodluck Ebele Jonathan era. A deep look at the economic status of these separatists today shows that things are no longer the same. Levels don change, they are 10/10. They are not like their followers parading the streets with faded clothes, empty tummies, varying degrees of indebtedness and no jobs. They live in posh houses; they wear expensive clothes, drive the best of cars and even sit with prominent individuals in the society. The Biafra cause is a ‘win win’ for them in success or failure. If it fails, they get paid as long as they can sustain the hopes they raise; if it succeeds, they hit the jackpot by assuming the status of a Nelson Mandela. If the words of the seemingly untrusted Minister of Information and Culture, Lai Mohammed that the treasury looters in the opposition party and other rogue countries are funding Biafra are to be believed for once, then profits of secessionist movements might be so "Abacha or Diezanic" if thoroughly investigated. In a country like Nigeria where the Human Development Index is low, it would take more than a ‘Python Dance’ and ‘Crocodile Smile’ to take the balanced diet off the mouths of Kanu, Nwazuruike and other front-liners without a bloody fight. This is their means of livelihood, it is their hustle with due respect.